Review: REN Omega 3 Night Repair Serum | Becky Alyssa's Beauty Box. First of all, apologies for my gross-looking nails – I did an experiment with Barry M’s new sequin nail polish that didn’t quite go to plan – more on that another time! I’ve been on a bit of a skincare obsession lately – my skin had got itself into a horrible state and it’s always been quite difficult for as long as I can remember. From super-oiliness and spots to random dry patches and sensitivity, I didn’t even know where to start. After using drugstore skincare for long enough and coming to the conclusion that most of it is decidedly ‘meh’ with harsh synthetic fragrances and ingredients that just don’t do enough for me, I decided to branch out a bit and try this night serum by Ren in hope of balancing my troubled skin (or at least starting to). The product comes in a clear 50ml pump tube with a plastic lid, making it easy for travelling as well as seeing how much you have left. You only need to use a single pump of product as the consistency is very viscous and oily, a tiny amount being plenty to cover the face. The smell is divine, a gorgeous natural peach scent – so lovely I don’t want to wash my hands afterwards. At first I was slightly worried about putting such an oily product on my already oily skin, but after having so much success with coconut oil and Moroccan Oil on my hair, I went ahead anyway and hoped for the best. First impressions the next day: my skin already felt softer and smoother. However it did clog the pores on my nose, so I’ve avoided using it on my nose since. I’d also recommend wearing a stretchy hairband or wearing your hair up while you sleep to prevent hair becoming greasy from picking up oil off your face. After using for a few weeks, my skin is better than I could’ve hoped. My skin has felt softer and lovelier every day and I can remove any lingering oiliness with my toner before getting ready. This serum has done a marvellous job of nourishing my skin overnight and restoring much-needed hydration, even to dry areas I didn’t know I had (sounds crazy but when they’ve been there so long you forget)! I haven’t noticed any scars or marks significantly fading; however the added hydration has really helped even out the texture of the dry, uneven areas on my cheeks and forehead. To best suit my skin, I apply a single pump of this to my face, avoiding my nose area, then after allowing it to sink in for 10 minutes I apply a small amount of my usual night cream all over, nose included. I follow by applying my eye cream, putting a stretchy hairband on to keep hair off my face and I’m ready to wake up to lovely radiant skin the next morning! Not to mention, using a face mask in the evening once a week before applying helps refresh your skin and maximise the positive effects of this serum. So glad I tried this – I’ll definitely be finishing the whole tube before long and can’t wait to try more products from Ren. 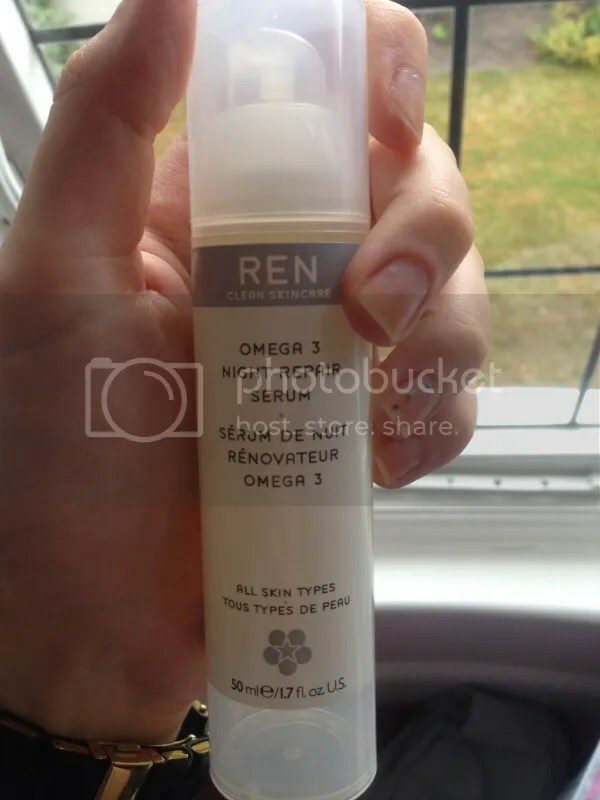 I bought mine from Salon Skincare for £32.29, or you can buy it from Ren‘s website for £34. Have you tried this serum before? What about other Ren products – do you think they’re all worth the hype? Pingback: My No-Buy August: Week 3..and REN Skincare discount codes! | Becky Alyssa's Beauty Box.